SEAir (Tigerair Philippines) to change its name to Go Air, Inc.
SEAir-South East Asian Airlines (Tigerair Philippines) (Manila) has been approved by the Civil Aeronautics Board (CAB) to change its corporate name to Go Air, Inc. The SEAir name is being returned to the original owner according to the Business Mirror. Cebu Pacific Air (Manila) acquired the low-fare airline from Tigerair and a decision is pending on the future operating name. 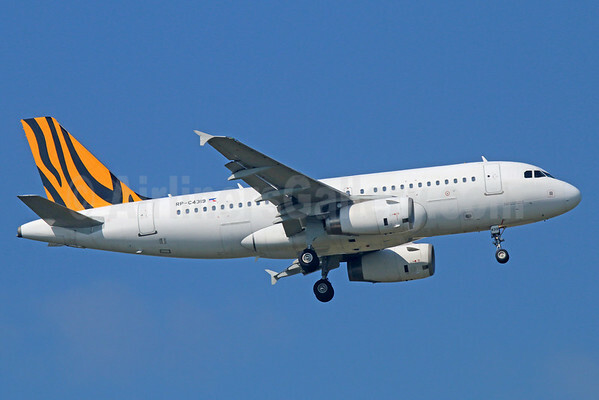 The Tigerair brand is likely to be discontinued in the Philippines. Copyright Photo: Michael B. Ing/AirlinersGallery.com. The Tiger stripes will soon be gone from SEAir aircraft. Airbus A319-132 RP-C4319 (msn 3757) arrives in Bangkok. This entry was posted in Cebu Pacific Air, Go Air (Philippines), SEAIR (South East Asian Airlines), Tigerair Philippines and tagged A319, A319-100, A319-132, Airbus, Airbus A319, Airbus A319-100, Bangkok, BKK, Go Air (Philippines), RP-C4319, SEAIR, SEAIR (South East Asian Airlines), Tigerair, Tigerair Philippines on April 27, 2014 by Bruce Drum.